 Elsa has had a lifelong interest in needlecraft - crochet, knitting, cross-stitch, embroidery and latterly quilting. Her first sewing machine was a twenty-first birthday present from me, and her sixtieth birthday present from me was her current Bernina. Only recently have I begun to record her efforts. Here is a sample, in chronological order of completion. 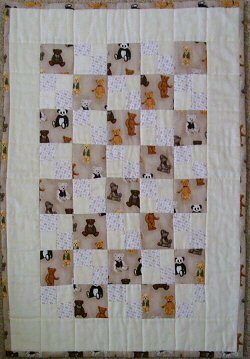 In anticipation of our first grandchild, Elsa fulfilled a long-standing ambition by making her first quilt. In my ignorance I had imagined it involved little more than sewing a few patches together, but it proved a lengthy learning exercise for her about tools and techniques - creating an interesting but not too complex pattern; choosing appropriate matching materials; mastering the technique of borders and corners; selecting the right quilt lining and backing; finding and learning how to use a 'walking foot'. The result (right) was a great success much admired by the family, quickly followed by many requests and the incentive to make another. 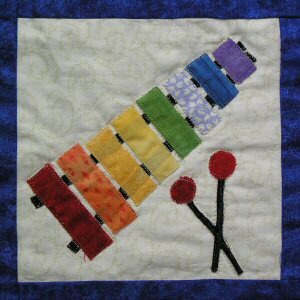 Elsa's second quilt was a little more ambitious. The centre panel was made in squares and then cut into four interlocking pieces, rotated by 45 degrees and reassembled to create this distinctive diamond pattern. A jigsaw masterpiece! 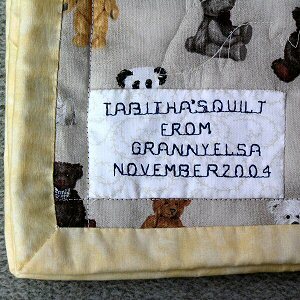 This was Elsa's first major retirement project, a bed quilt for our granddaughter Tabitha. 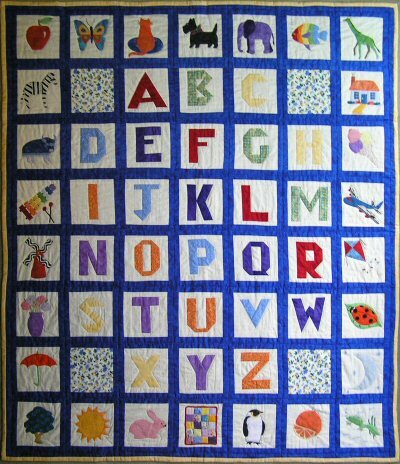 Measuring four feet six inches by five feet (137 cms by 152 cms), it comprises fifty-six squares containing the letters of the alphabet and an appropriate picture for each letter. It took her in excess of two hundred hours to make - a true labour of love. Knitting seems to be a vanishing skill. In our youth most girls were taught to knit; as a mere boy even I could manage a 'knit-one pearl-one' scarf (with my mother correcting my mistakes!). When Elsa began teaching she would teach her class of ten/eleven year-old girls to knit and crochet, but the time constraints of the National Curriculum eventually put a stop to that. 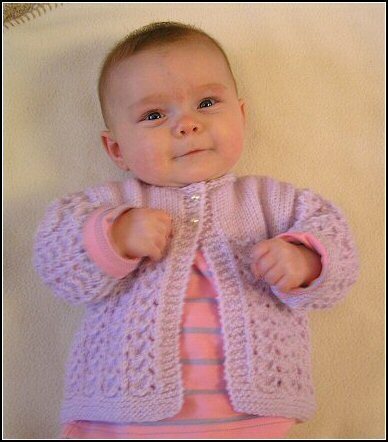 Today hardly any children and very few of their parents can knit, and those who are able to can rarely find the time. Thus garments like this are the near exclusive preserve of grannies; this is one of Elsa's contribution to the dwindling stock of hand-knitted garments. Once you have learned how to do something well there is a continuing desire to keep doing it. 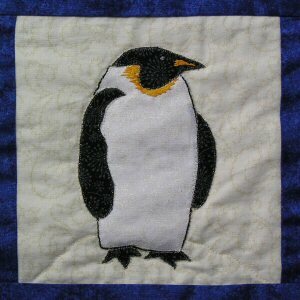 Quilting, it seems, is no exception. So when Sally, a former colleague from school and a good friend, announced that she was expecting Elsa seized the opportunity and repaired to the sewing machine. 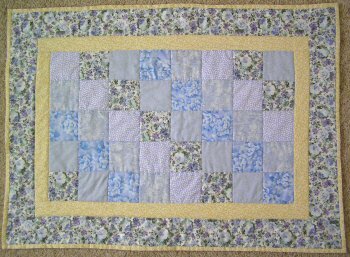 Despite this being quilt number four there were still plenty of new techniques to try, many simply better ways of detail finishing and stitch concealment. It is truly surprising that such an apparently commonplace craft should have such hidden depths. A few years ago we saw a wonderful display of quilts in the Denver Capitol as part of Colorado's 125th anniversary celebration. Some were of mammoth proportions requiring hundreds of hours work. We are about to buy a new double bed - oh no! 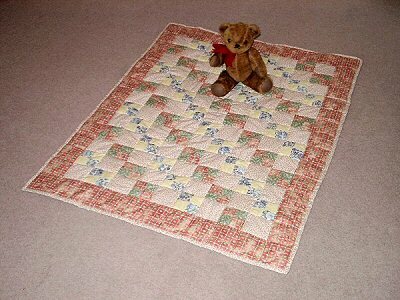 Joe is our first grandson, but nevertheless entitled to a quilt! 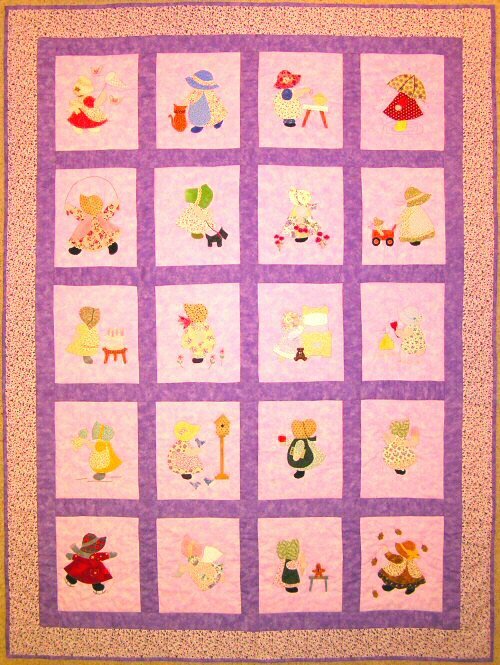 As our grandchildren grow up their beds get bigger too, so Elsa is never at a loss to find a reason for making another quilt. 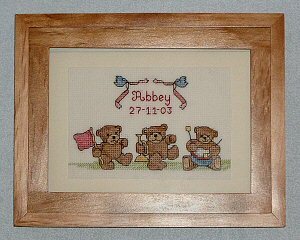 This time it was for Tilly, who has just had her second birthday and is about to have a 'proper bed' of her own. This proved to be the largest one yet. 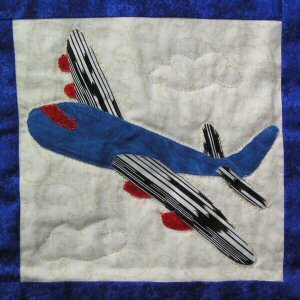 Although the individual squares are bigger than the earlier ones, each picture required some intricate appliqué work using a wide variety of different fabrics. Elsa found it fun dressing up all the little figures.